Highly expressed in the placenta and testis. Expressed at lower levels in the brain, heart, kidney, liver and lung. Overexpressed in esophageal cancer. 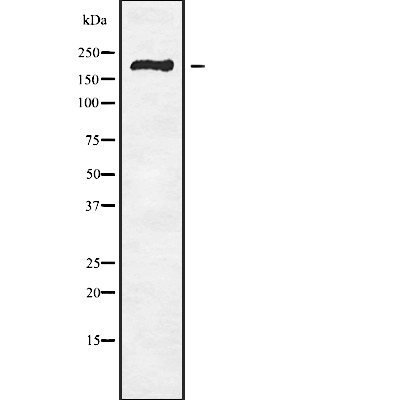 Small volumes of anti-RBBP6 antibody vial(s) may occasionally become entrapped in the seal of the product vial during shipment and storage. If necessary, briefly centrifuge the vial on a tabletop centrifuge to dislodge any liquid in the container`s cap. Certain products may require to ship with dry ice and additional dry ice fee may apply. Function: E3 ubiquitin-protein ligase which promotes ubiquitination of YBX1, leading to its degradation by the proteasome (PubMed:18851979). May play a role as a scaffold protein to promote the assembly of the p53/TP53-MDM2 complex, resulting in increase of MDM2-mediated ubiquitination and degradation of p53/TP53; may function as negative regulator of p53/TP53, leading to both apoptosis and cell growth (By similarity). Regulates DNA-replication and the stability of chromosomal common fragile sites (CFSs) in a ZBTB38-and MCM10-dependent manner. Controls ZBTB38 protein stability and abundance via ubiquitination and proteasomal degradation, and ZBTB38 in turn negatively regulates the expression of MCM10 which plays an important role in DNA-replication (PubMed:24726359). Subunit Structure: Interacts with p53/TP53 and RB1 (By similarity). Interacts also with MDM2 and YBX1. Interacts with NEK6. Interacts with ZBTB38. Post-translational Modifications: Phosphorylated by NEK6. NCBI/Uniprot data below describe general gene information for RBBP6. It may not necessarily be applicable to this product. E3 ubiquitin-protein ligase which promotes ubiquitination of YBX1, leading to its degradation by the proteasome (PubMed:18851979). May play a role as a scaffold protein to promote the assembly of the p53/TP53-MDM2 complex, resulting in increase of MDM2-mediated ubiquitination and degradation of p53/TP53; may function as negative regulator of p53/TP53, leading to both apoptosis and cell growth (). Regulates DNA-replication and the stability of chromosomal common fragile sites (CFSs) in a ZBTB38- and MCM10-dependent manner. Controls ZBTB38 protein stability and abundance via ubiquitination and proteasomal degradation, and ZBTB38 in turn negatively regulates the expression of MCM10 which plays an important role in DNA-replication (PubMed:24726359). 1. RBBP6 might potentiate cervical carcinoma cell viability.